J.T.’s Discount Verticals the leader in FULL SERVICE drapes, drapery, window treatment & window covering sales & installations. Providing quality vertical blinds, horizontal blinds, shades, shutters & drapery to residents of Staten Island, NY. With our FREE shop-at-home service we bring a complete window treatment showroom direct to you, which allows you to choose from 100’s of samples from a wide variety of the most popular and stylish manufacturers right from the comfort of your own home, apartment or office. See which styles and colors of drapes & drapery, work best with the color, style and look and get professional advice, tips and experience on the best choices for your home, apartment or office. Premium service, selection and expertise you will not get from big box chains. Drapes and drapery are fabric panels, and typically sold in pairs. 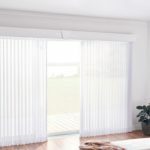 The differences between curtains and drapes, however, is drapes are lined with heavy fabric to block outside light, making them perfect for bedroom use. Drapes (sometimes called draperies) are long and usually the top of the window to the floor. Heavier stiff fabrics are typical for drapes, including luxury materials like velvet, damask, or silk. While drapes come in a range of styles and colors, they are most often solid rather than heavily patterned. The top of a drapery panel is often pleated, and these pleats, along with the heavy fabric, contribute to the formal appearance of this popular window treatment. Like curtains, drapes hang from a rod on rings, hooks, grommets or a fabric sleeve at the top or on the back of the panel. In the bedroom, the most popular draperies are the blackout style, which keep the room dark enough for deep sleep. These are an especially good choice for anyone who needs to sleep during the day, such as night shift workers. 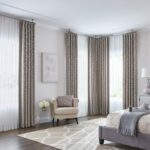 Serving Staten Island NY for more than 30 Years we have the selection, price and service to make you choice of vertical blinds, horizontal blinds, shades, curtains & drapes one that will make your home stylish, comfortable & energy efficient at a price and convenience not offered by online catalogs or big box retailers. If you’re looking for the best in price, selection, installation and service on window treatments and window coverings in Staten Island NY we are the company you should call first.